Last week, we posted our very last Fast Forward Friday. So, this week will start our new Friday series. This one will be called Flashback Friday. 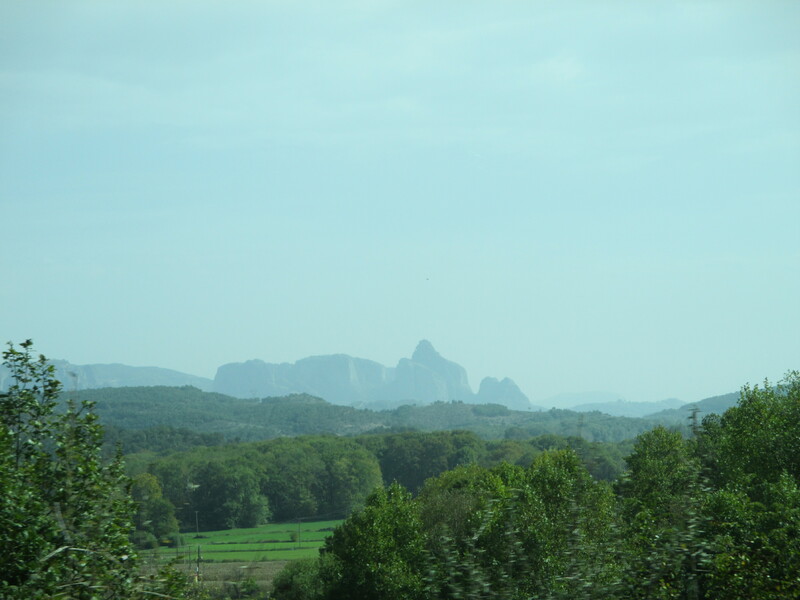 It will be a pictures series for us to share photos from our travels or from home. 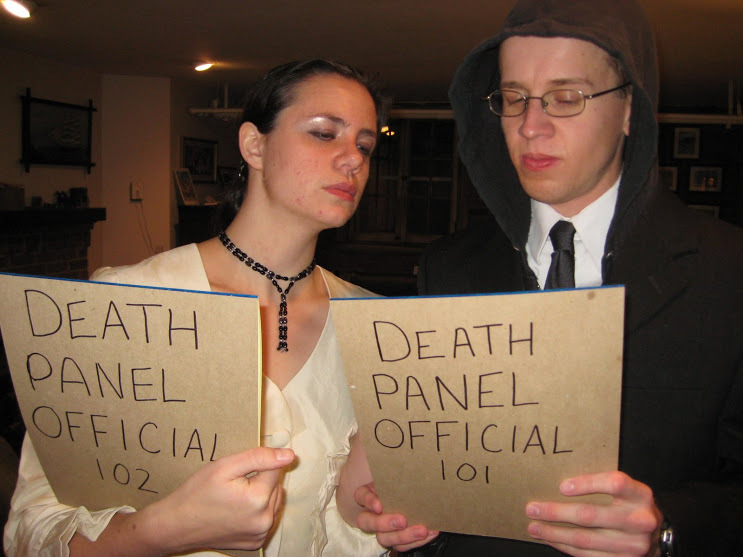 Halloween is one of our favorite holidays. We are pretty bummed to be missing out this year. 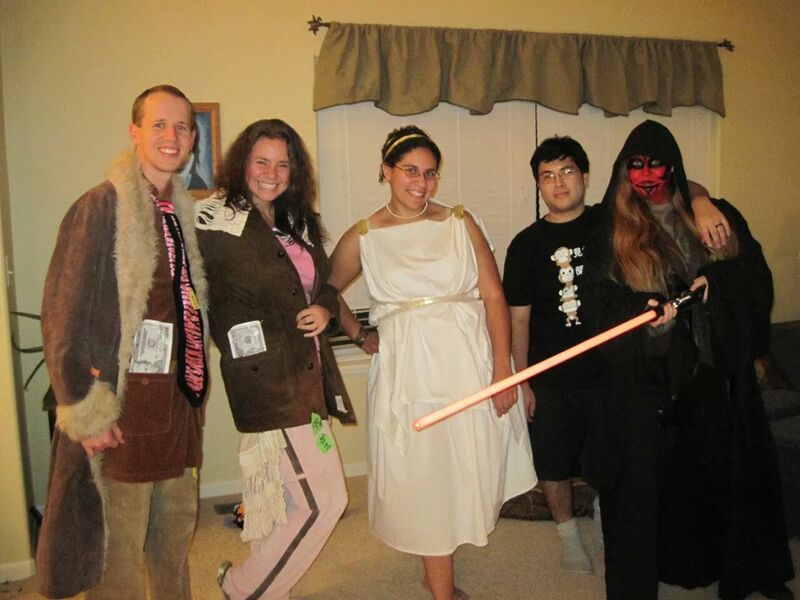 For our first Flashback Friday, we are remembering some great Halloweens! 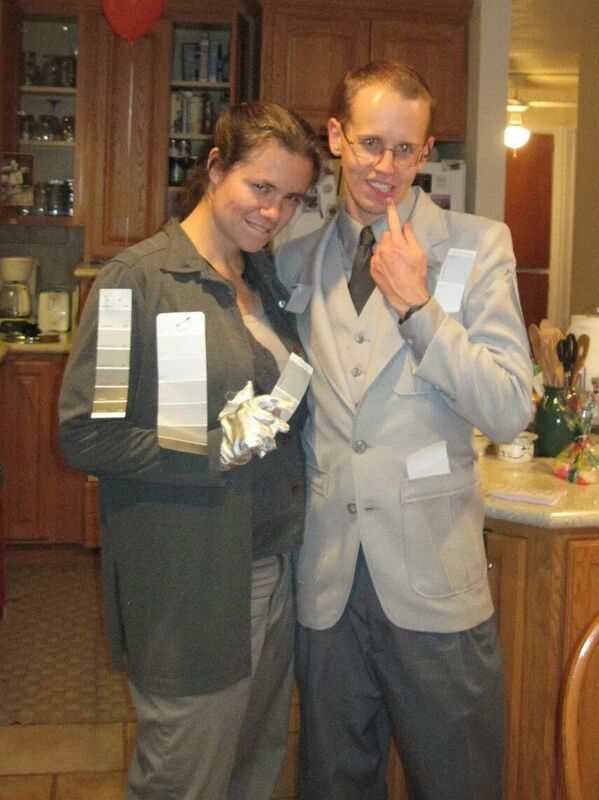 What are your costumes this year?? Moments of Misery: Bed Bugs…? Good night, don’t let the bed bugs bite! Normally you think this is just a cute little rhyme. It’s a lot less cute when, suddenly, the bed bugs do bite. 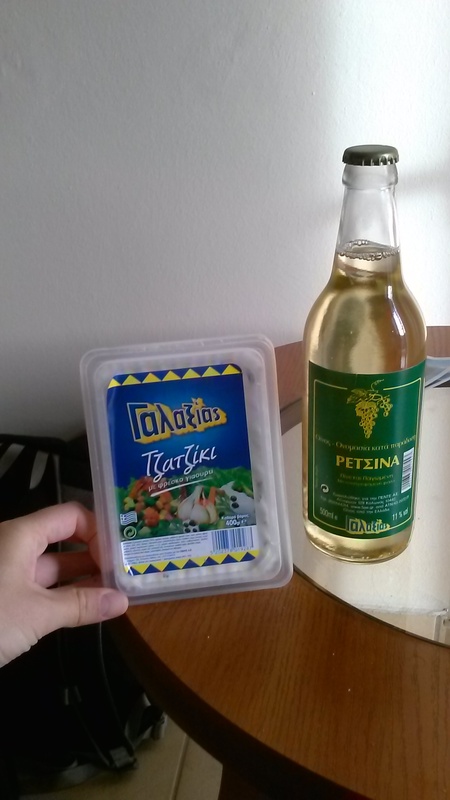 During our first stay in Greece, we woke up in the morning with some unexplained bites on our arms and heads. We weren’t really sure what they were. It seemed possible that they were mosquito bites… but they seemed to be a little bit too grouped for that. We didn’t see any evidence of bed bugs, so we didn’t worry too much… yet. We slept a second night at the same location. Eric woke up with bites again, this time it looked like some bug had marched up his back and around his neck… though Della had none. We met another couple who talked about their experience with bed bugs and it had some similarities to what we were experiencing. Again, we found no evidence of actual bugs though. 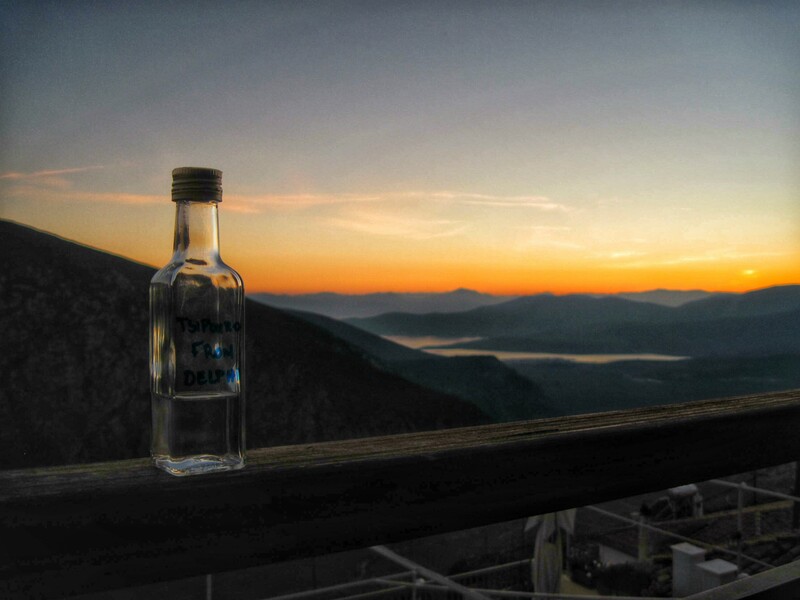 We moved to our second place in Greece, feeling incredibly guilty if we were bringing bugs along with us. Though, we took many precautions to keep the place safe. Another night and Eric had a few more bites, though now they seemed random and Della still had none. Bed bugs or not?!? We just couldn’t be sure. All of our research said we had to actually see the bugs! We took our bags apart and scoured everything. Della found nothing, but Eric found 2 things that might have maybe been bugs? Too small to tell. At this point we had a decision to make, continue our plans to head to the Peloponnese, staying in more small towns, or head to Athens where we could find a laundromat and try to kill the maybe bugs once and for all. We used some info from this site and our new travel friends who talked about how they got rid of them. 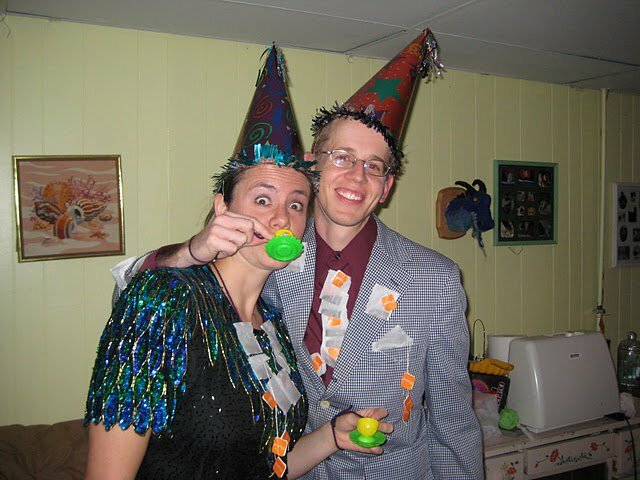 Oh… did I mention that this was happening on our 10 year anniversary??? 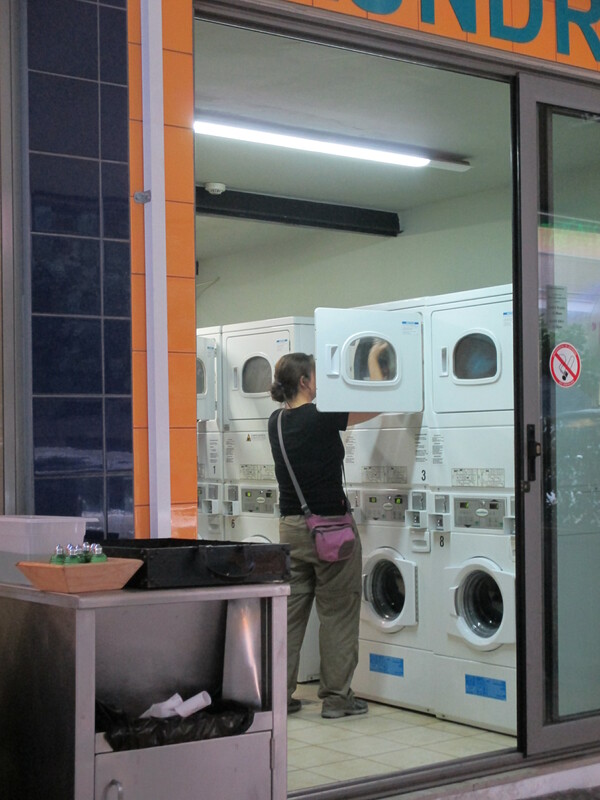 We decided to head to Athens where we found a laundromat and promptly washed and/or dried every piece of clothing or bags we have. This included all of our packing cubes, our toiletry kits, our day bags, and even our large bags themselves, as well as our clothes of course. This was not super easy as we had to take everything apart and somehow figure out how to get the bags in small dryers. 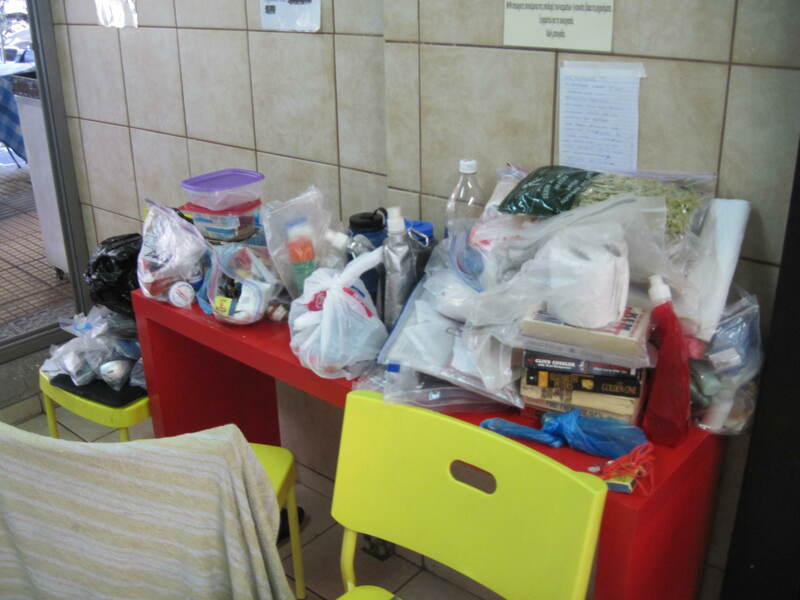 Everything came out of our bags… Can you believe we carry that much stuff around? Most of it is in the washer or dryer even! A couple hours and almost 15 euro later we were done. We headed to our AirBnB feeling pretty confident that it would be just us for the night. Connections: Rick Steves, Wheel of Time, and Wine! 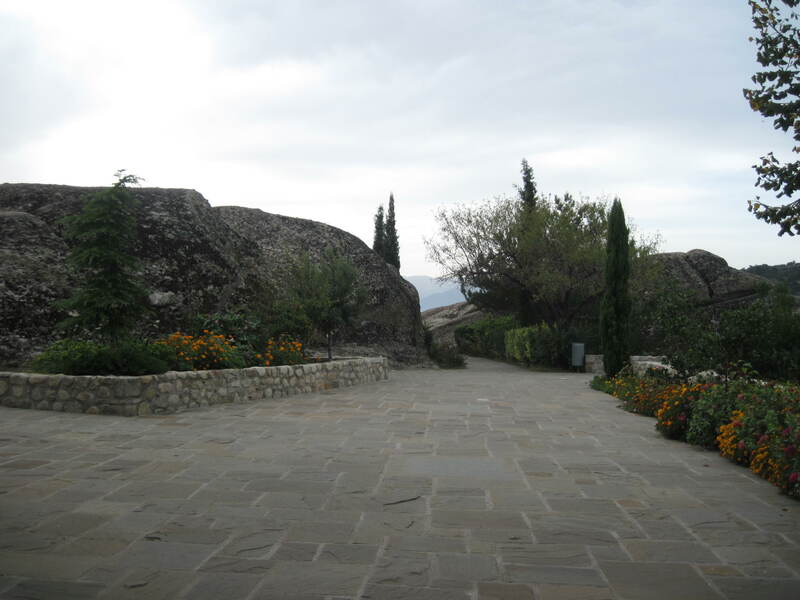 We were leaving Meteora, a little unsure what the day would hold. 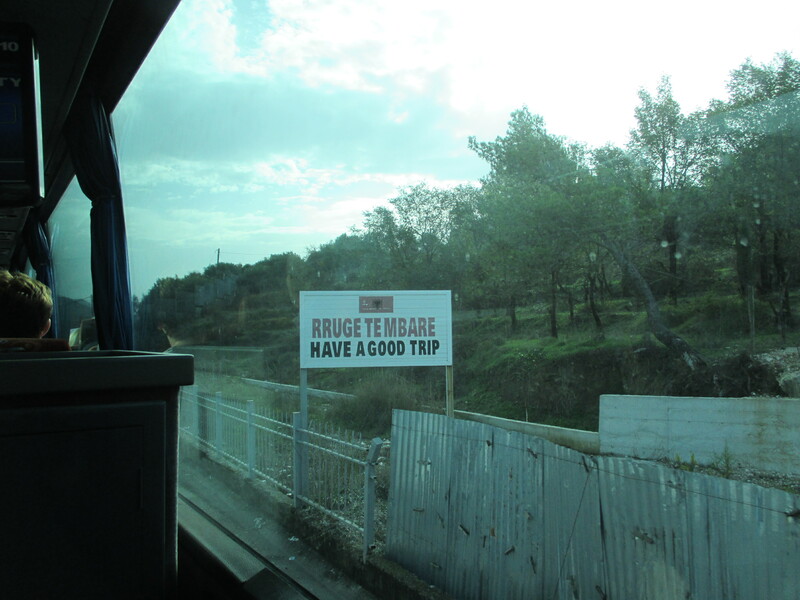 We were hoping to make it all the way to Delphi, not very far by distance, but at least 4 bus rides… we were told. We hadn’t even made a hotel reservation because we were slightly unsure that we would even make it all in one day. The first bus left at 8 AM, which is quite early for us. We were sitting at the bus stop, still trying to wake up, while waiting for the bus when we saw a welcome sight. Two more backpackers, heading our direction! As soon as they sat down, they said hello and we quickly found out that we were both planning this long confusing day of travel. We found out over the course of our loong travel day that they were a couple also from the USA, who we really enjoyed chatting with. When we arrived in Delphi they graciously shared where they were staying. It had been on our list from when we were looking so we were pleased when we also were able to stay there. 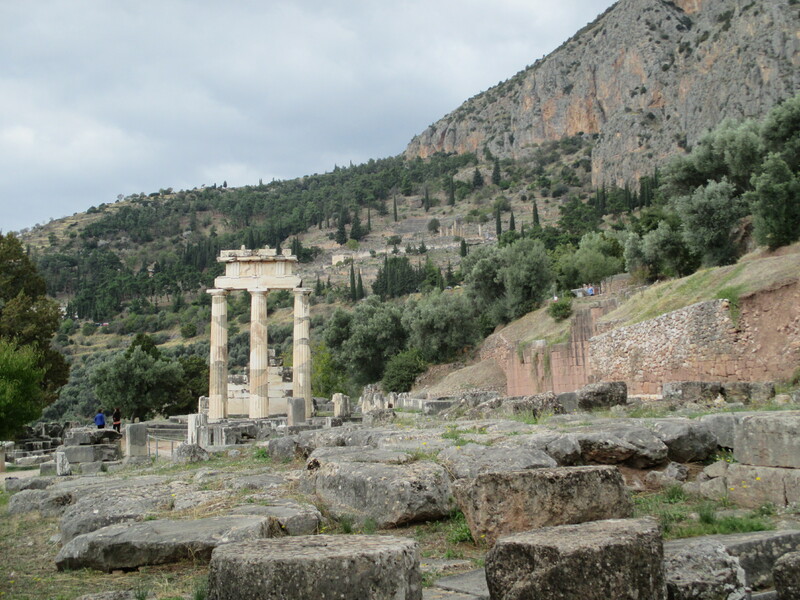 The next day, we all left the hotel together and headed off towards the ancient site of the Oracle of Delphi. Here we were even more impressed with our new travel companions. Not only did they really know a lot about ancient Greece (we learned a lot!) but they were equally interested in hearing from our Rick Steves’ guidebook and even reading informational signs. Let me say that again: they wanted to hear from the guidebook AND take the time to read the signs. We were thrilled! There just aren’t that many people out there who can go as slow through museums and sites as we can (and wish to). We enjoyed a lovely day with them. It was so much fun we decided to hang out again the next day. This time we decided to take a day long walk down from the mountain all the way to the coast. It was a long, lovely walk and we found that enjoyed them even more! They were into all the same TV shows and book series that we were. I mean, let’s be honest, there are not that many people out there who are super excited about Robert Jordan’s Wheel of Time series (OK, there probably are… we just haven’t met them!) Another great day. 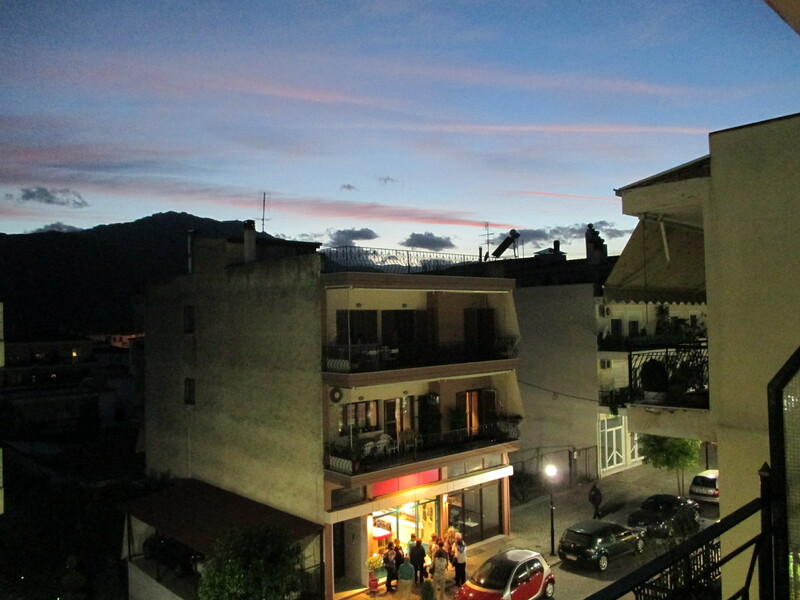 We all decided that we were having so much fun in Delphi that we wanted to stay another night. So, we had another fun evening of drinking wine in our hotel. From there, we were all heading to Athens so we took another long journey together. We were fortunate to be able to meet one more time for dinner in amazing Athens, eating dinner practically in the shadow of the Acropolis. Another great connection with some amazing people! We were sorry to have to say goodbye! 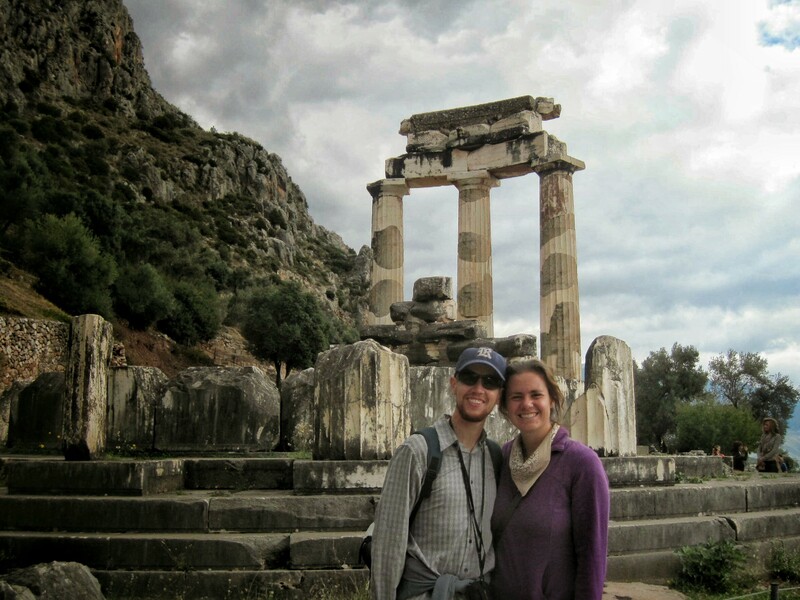 Our second stop in Greece was the town and archaeological site of Delphi. The Ancient Greeks considered this area to be the center of the world, and the best place to worship Apollo. Dignitaries would come to the Temple of Apollo at Delphi to get advice on big decisions from the priestesses located here. We weren’t planning on getting any advice, but we hoped to see the plethora of structures left over from when Delphi was such a prime destination. We didn’t end up getting to Delphi until about 4:30 PM, so definitely a long day of travel! 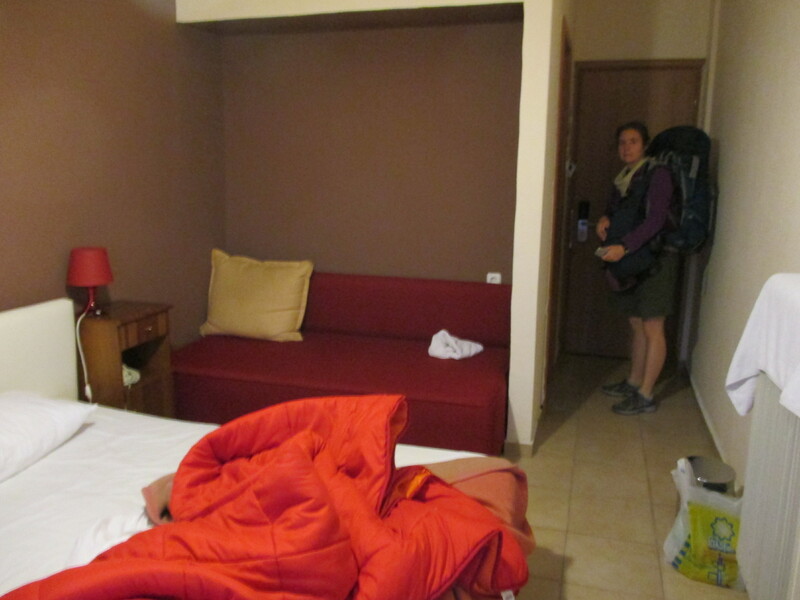 We hadn’t pre-booked anything before arriving in Delphi because we weren’t positive we would make it in one day. So, we arrived without a plan, but our travel friends were headed to a place that sounded good so we tagged along and got a room at Hotel Athina. The room was nice, but we had a shared bathroom that was a little rustic, so after two nights we switched (along with our travel friends) to the Sibylla Hotel, where we had our own bathroom. Our favorite feature of both rooms was a nice balcony with a great view over the valley below. 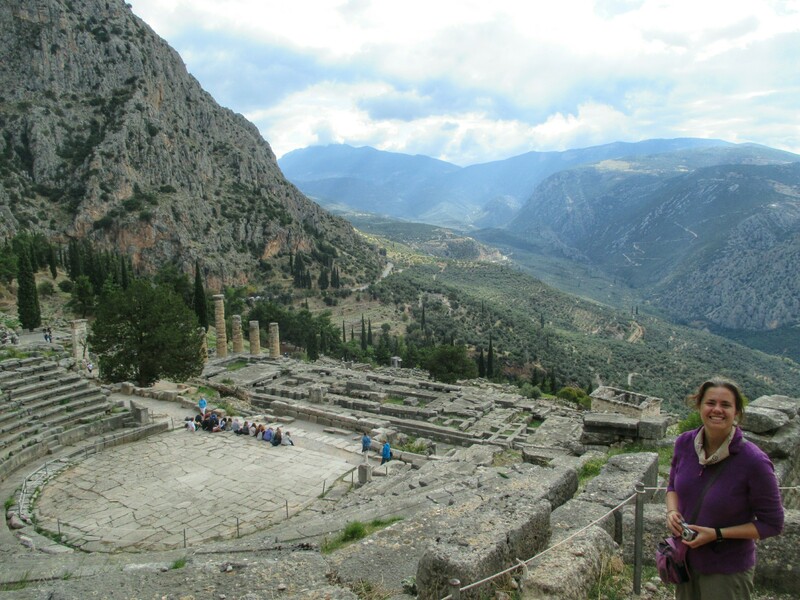 The Delphi Archaeological Site and Museum – This is the main attraction in town, so we tackled this the first day. We bought a combination ticket to both the outdoor site with the ruins and the museum which houses a lot of the sculptures found at the site. We toured the site first. The biggest part of the site is the sanctuary of Apollo, the big destination for those coming to consult the Oracle. Delphi was an active site from at least the 8th century BC up until the 4th century AD (meaning even the Romans kept the site active). Since it was such a popular site, many of the different Greek city states built “treasuries” containing offerings to Apollo to thank the oracle for her advice. The most well-preserved of the treasuries is the Athenian Treasury, built by the Athenians to commemorate their victory at the Battle of Marathon. Why did this cat pay for a guided tour if it wasn’t going to pay attention? The main attraction in the sanctuary was the Temple of Apollo. The oracle would sit in the middle of the temple over a natural fissure in the rock and speak in tongues. Priests would interpret the words for those who came to ask a question. (Some say that there were hallucinatory vapors coming from the fissure). There isn’t much left of the temple but it is still fun to imagine walking up the ramp and waiting to ask your big question. 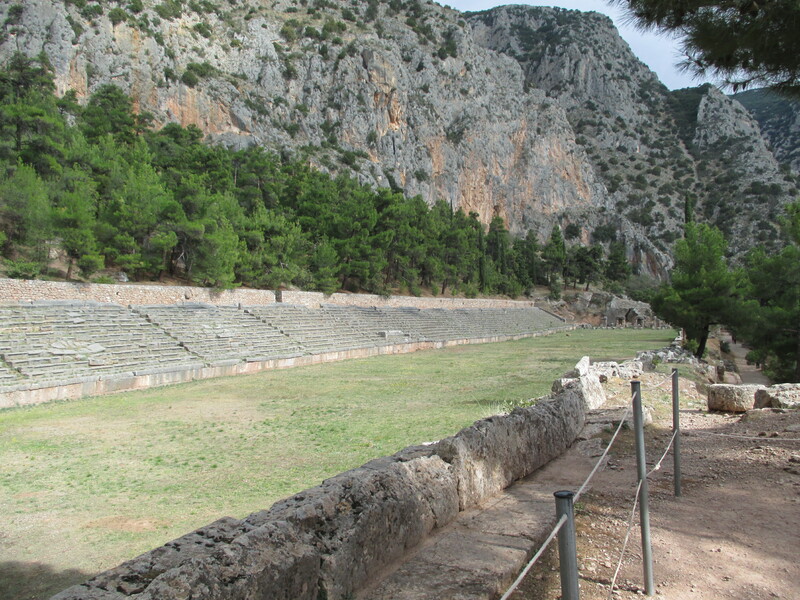 Delphi was also the host site of the Pythian Games. Similar to the Olympic Games, these were gatherings of all the Greek peoples every four year to compete in various contests. The stadium where the athletic events took place is at the top of the hill. The Pythian Games also included artistic competitions; a large theater used for these can be found at the site as well. Apollo was the main god being worshiped at Delphi, but there was also a smaller area with structures dedicated to Athena. This is just a few minutes walk further down the road from the main site. The most iconic ruin here is the Tholos, with its three reconstructed columns. They haven’t actually figured out what its purpose was. Hike Down to Itea – Most people only spend a day in Delphi, but the natural setting on the side of the mountain was great, and the weather was perfect. 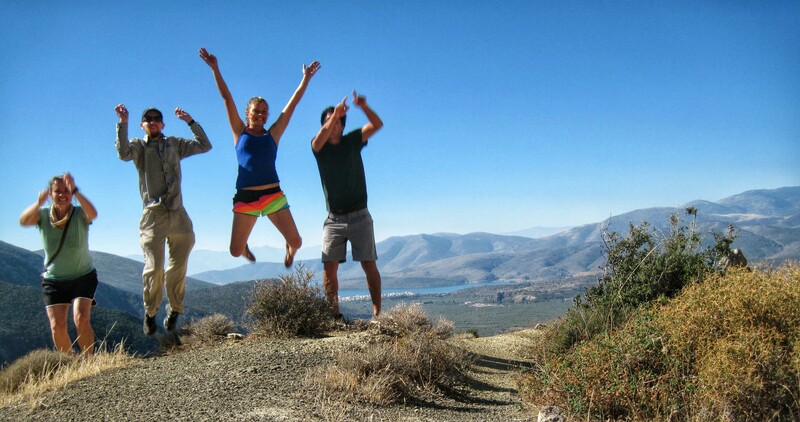 We had read about a hike in the Lonely Planet, and decided to spend a day doing it along with our travel friends. 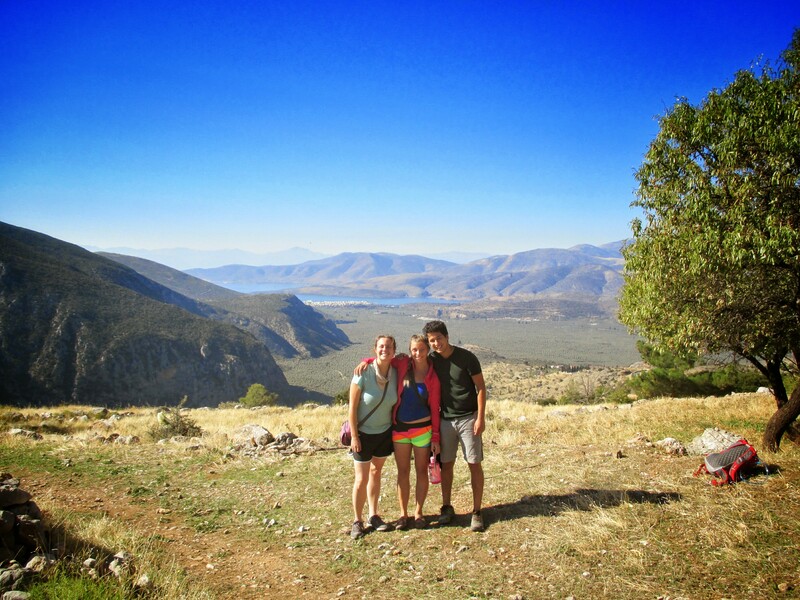 The hike goes from Delphi all the way down the to the Gulf of Corinth at a town called Kirra. This retraces (in reverse) the route that pilgrims coming to Delphi via sea would take once they had landed their boats. The scenery for the hike was quite pretty.The first half descending down the slopes of the mountains and through the town of Chrissos provided great views over the valley and out to the Gulf. Then, the second half of the hike along the valley floor went through a giant olive grove -according to Lonely Plant the largest continuous olive grove in Greece. The trail was supposed to end in Kirra, but somewhere in the olive grove we took a wrong turn and ended up closer to the neighboring town of Itea. This wasn’t too bad though, because our main goal was just to find a beach, and Itea is also on the coast! We found a spot on the pebbly beach (not too hard since it is starting to be low season) and had a nice relaxing afternoon. The water was a little chilly, so we didn’t swim for too long. Luckily, we didn’t have to backtrack and hike our way back up the mountain! Instead, we just took one of the local buses that whisked us back up there for a small fee. Our Rick Steves guidebook recommended a few different tavernas in town. The first night we came across one and decided to give it a try. 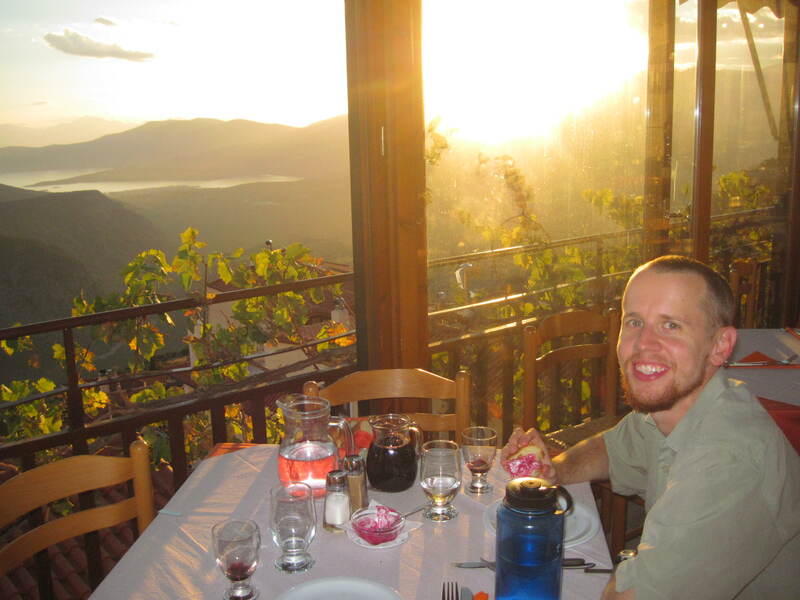 The food was pretty good, but the best part was the view of the great sunset from our table. 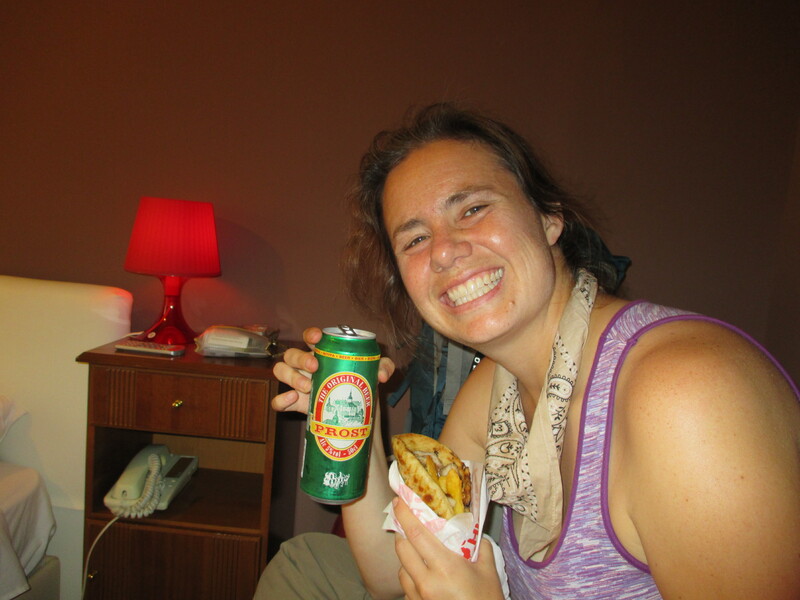 Two of the nights we spent in town, we found a cheap pita place on the upper street in town. Not as fancy of an ambiance, but definitely a good amount of food for the money! We really enjoyed our time in Delphi. We knew that we would appreciate the archaelogical importance, but we weren’t expecting to be as drawn in by the natural surroundings as we were. The great weather every day helped as well. And to top it off, it made it even more fun to be able to share with new friends! 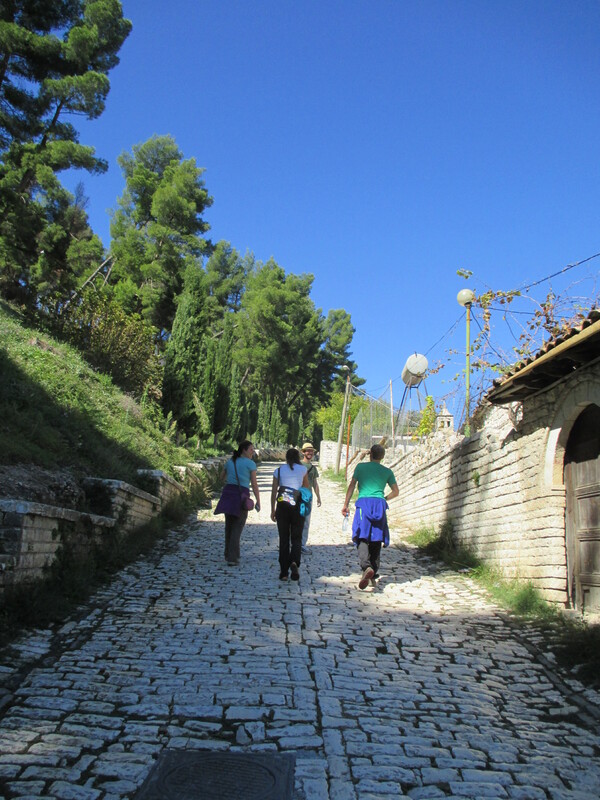 We really enjoyed our time in Berat, Albania. We were able to meet and enjoy a lot of people from around the world. 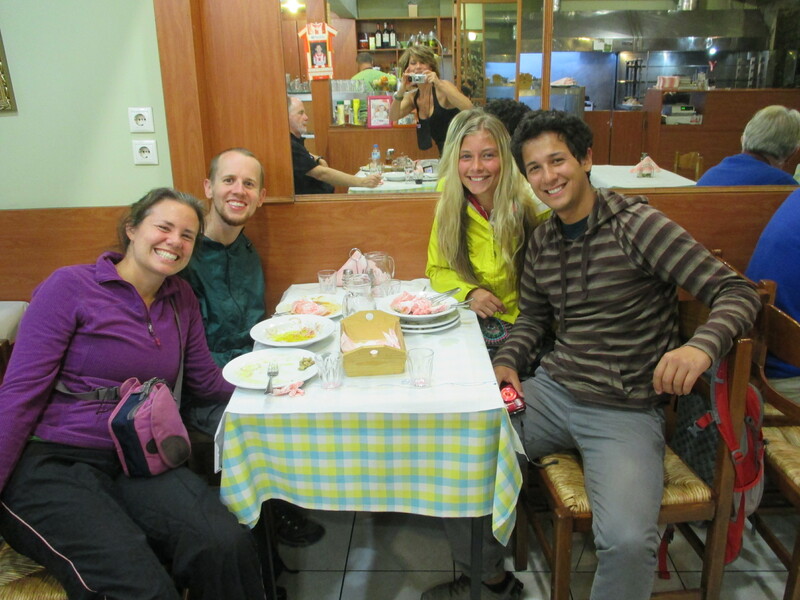 Not only did we meet an amazing Albanian tour guide/hostel worker, but we met another amazing traveling couple. This Belgian couple is traveling from Europe to Asia on bikes! Yes, that is correct, they are biking across the world! Amazing, right? Let’s just say that our trip felt positively cushy when thinking about theirs. 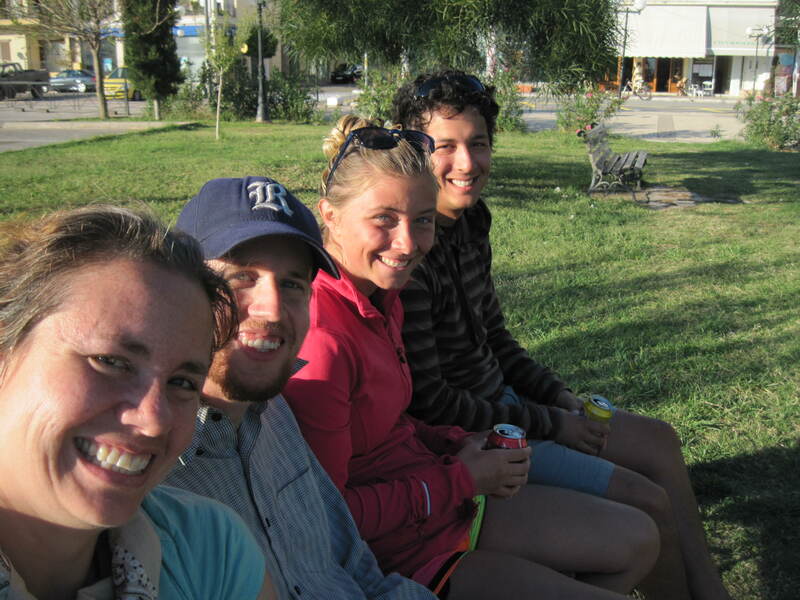 We met them during our tour of Berat and found we had a lot of similarities relating to our trip, age, and interests. We particularly enjoyed chatting about teaching (he works at a university to train teachers) and the differences between Belgium and the U.S. especially related to voting, politics, and other governmental systems. One of the really fun things about meeting people on the road is being able to share experiences like this. We spent a wonderful day and fun evening with them in Albania. One of the really sad things about meeting people on the road is having to say goodbye knowing that it is unlikely that you will meet again. One of the slightly unusual things about this connection was that we didn’t have to say that goodbye right away. We knew that we were traveling the same directions, from Berat to Gjirokaster, and then on to Greece. They would be leaving ahead of us, though arriving behind us (they’re on bikes remember??) but we discovered we would be in Gjirokaster at the same time. We exchanged contact info and planned to meet up again. Unfortunately, our plans in Gjirokaster fell through. What a bummer! However, that made it all that much more fun when we realized a few days down the road that we would be in Meteora, Greece at the same time! We enjoyed another excellent evening with this excellent couple! Now, it is hard to expect more than that, so we were especially thrilled when we saw the same couple (ever so) briefly in Delphi, Greece as well. After all of that, I hope we do manage to meet again some day! 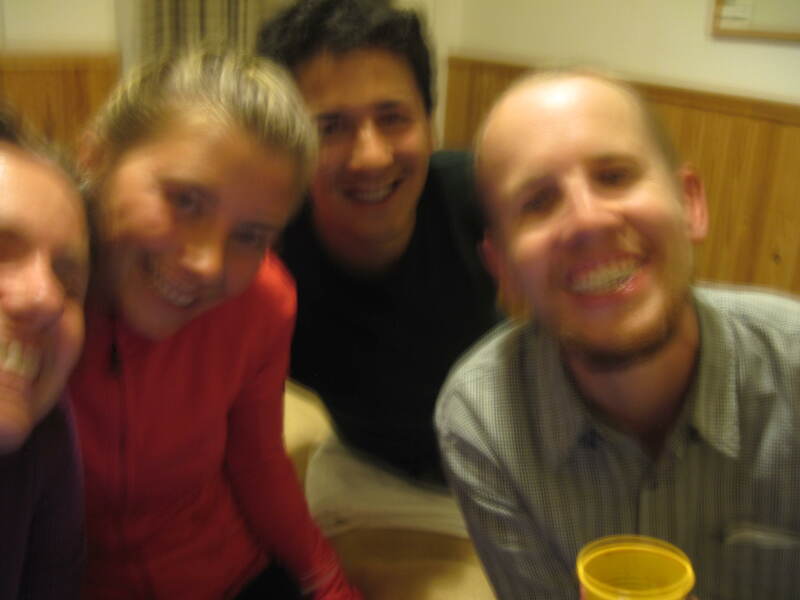 Unfortunately, we failed and this was the only picture of us… Boo! Enjoy our photos from Bosnia Herzegovina. You can also access our photos on the top right “places we’ve visited” menu. We’re sorry these got put up so late! 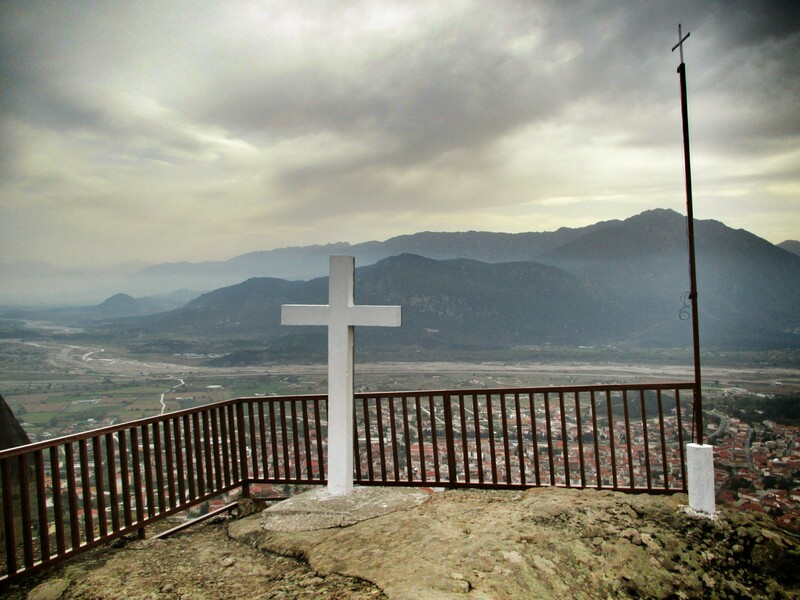 You can read more about our trip to Bosnia Herzegovina here!